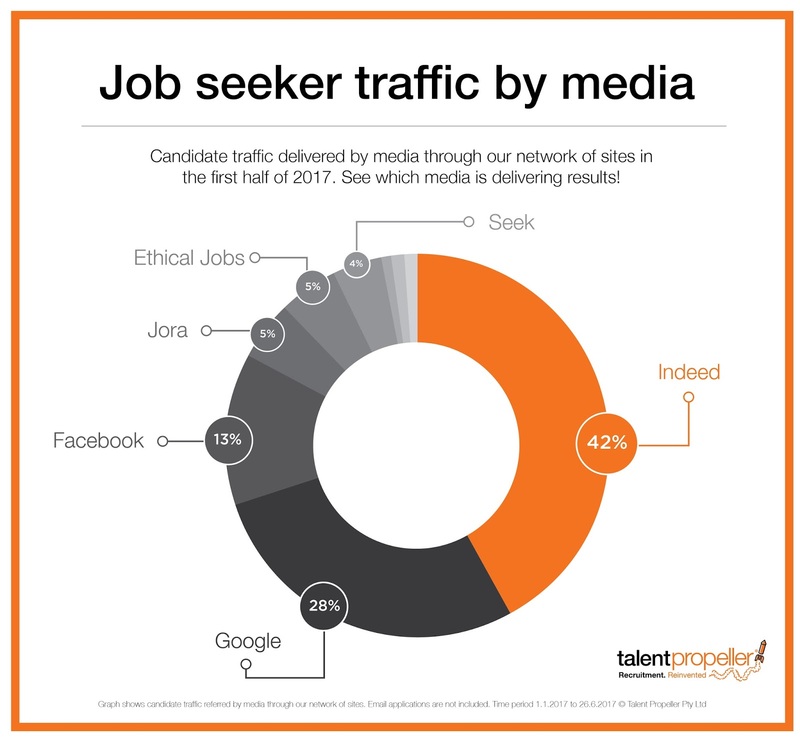 Talent Propeller: Which media is delivering candidates in 2017? Which media is delivering candidates in 2017? Advertising can be expensive and time-consuming - even more so when you get it wrong! Your entire recruitment experience can hinge on making the right media choice at the start of the process. The options for recruitment advertising are varied and as a Hiring Manager, it’s important you stay informed about which media channels are delivering the best candidates - and the best value for money. Social media and SEO have become more important and traditional ‘go to’ job ad mediums such as Seek are starting to lose their relevance with job seekers. The most common question we hear from our clients is ‘where should we advertise?' Typically they say that traditional job boards such as Seek are not delivering quality candidates anymore and they are looking for new, more effective options. So what are they? The trends we started to see in 2016 have continued in 2017, with Indeed continuing to be the dominant online medium. Indeed has delivered 42% of candidate traffic to our network of sites for both our Australian and NZ customers’ in the first half of 2017. With indexed ads ‘scraped’ from other media and a sophisticated search algorithm, Indeed covers both the ‘job board’ and the ‘SEO driven’ search markets. TradeMe continues to perform strongly in NZ at 12%. Their own recent analysis shows adverts Talent Propeller place on behalf of clients outperform their average by 18% in terms of views and 10% in terms of applications. This reflects not only a strong media but the impact of professional copywriting when it comes to capturing a candidate’s attention. On the subject of ads that work, when it comes to print ads, great design and a strong employer brand are fundamental to recognition and impact. We recommend you take the advice of a professional if you are using print advertising. It’s relevant and important in many areas, however, you must understand your audience or you risk being lost in the clutter. Traffic from Facebook and LinkedIn reflect the growing importance of social media. But it’s about more than just ‘we’ve got a vacancy, please share’ posts. A paid, targeted social media strategy includes careful targeting and tools such as video, as well as picking the right platform for your vacancy. Social media is an effective recruitment channel because it harnesses the power of people’s social networks to magnify the reach of your advertising. Seek has been declining over the past year through our network of sites, down to just 3-4% across both countries in 2017. The emergence of Seek owned Jora has had an impact. Jora is a ‘scraping’ site that since its launch this year already accounts for up to 5% of our traffic. Smart advertisers are catching onto the idea that they can more effectively spend $300 in a variety of media rather than just Seek, knowing their ads will be scraped to Jora or Indeed to increase their reach. Seek also charges small to medium clients a fee to link out to their ATS system or careers website, which restricts ROI data available to managers in many businesses. Not only does that mean that it costs more if you don’t want to receive applications by email, but it makes it hard to assess the ROI of each advert. Talent Propeller customers have up to the minute dashboard analytics that shows which media is delivering their applications and media that discourage or inhibit link outs impact on the free flow of this data. 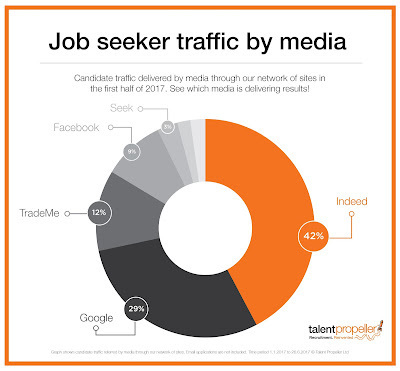 How a candidate searches for a job is an important consideration for advertisers. Job seekers are not going directly to a preferred job board anymore; rather, they are entering the job they want and location into a search engine (aka Google). For this reason, it’s important to have a multi-pronged approach, where search engines have multiple opportunities to find your job vacancy and serve in response to a search query. Google delivered 28% of AU and 29% of NZ visitors to client sites during the first half of 2017.